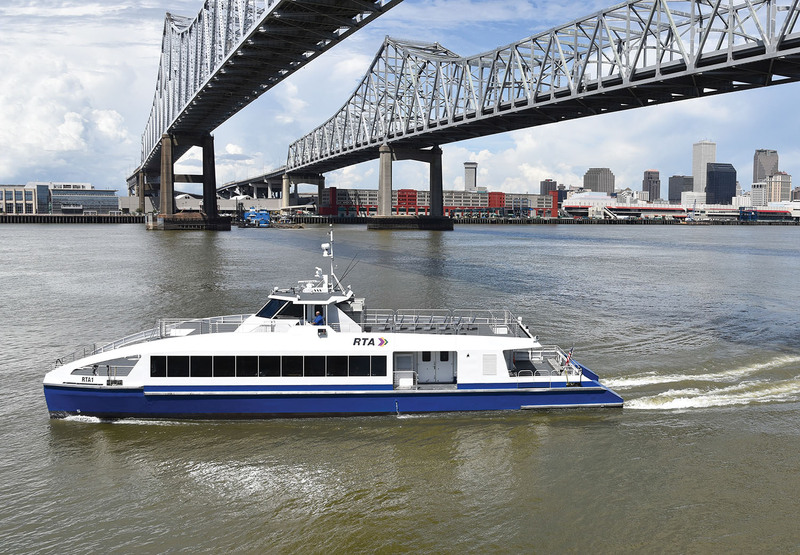 Shipbuilder Metal Shark announced November 12 that both new 105-foot, 150-passenger, high-speed aluminum catamaran passenger ferries constructed for the New Orleans Regional Transit Authority (RTA) have been completed and are ready to enter service. The first of the two new ferries was completed earlier this year and delivered to New Orleans in July. The second vessel is 100 percent complete at Metal Shark’s Franklin, La., shipyard where it successfully passed U.S. Coast Guard inspections at the beginning of October and is ready for delivery to New Orleans at RTA’s discretion. The new passenger ferries, RTA 1 and RTA 2, will replace the decades-old ferries currently operated in New Orleans and will usher in entirely new standards of comfort, safety, reliability and efficiency. The vessels were designed by BMT Designers & Planners and built to meet the specific requirements of the RTA. The Subchapter T compliant ferries are powered by twin 715 hp. Cat C-18 Tier 3 diesel engines and feature a low wake/low wash, high-efficiency hull design for reduced environmental impact. Metal Shark offers a broad portfolio of hull designs that may be fully customized with digital design and an in-house team of more than 50 naval architects and maritime engineers. With three fully self-contained shipbuilding facilities in Alabama and Louisiana spanning over 75 acres, Metal Shark’s 500-plus employees produce more than 200 vessels per year.